“A superorganism is a creature made up of many different individuals. Thanks to technological systems. You are me and I am you. We are tied together into a single processing system“, states a computerised wildlife commentator on ‘SPRORGNSM’. Bedroom-pop band Superorganism‘s self-titled debut release is likely to be the most zeitgeist and relevant record to be released this year. Everything about it – from its pop culture lyrics (talking about Facebook, to Camgirls, to gifs, Holograms and Green screens), to its production process, the unique cyber story behind its creation and even its faults (its hyperactivity) – represent the current generation’s approach to life. Superorganism are a multicultural species. The majority of the octet are from New Zealand. The New Zeleanders being Mark Turner, Tim Shann, Blair Everson and Christopher Young that originally hailed from a guitar band called The Emersons and compatriot backing singers Ruby and B. Yet they are fronted by an ambitious Japanese teenager – Orono Noguchi (OJ) – who was living in the States and the band is completed with South Korean vocalist Soul. Debut single ‘Something For Your M.I.N.D’ and ‘It’s All Good’ feature Korean lyrics meaning “How Does It Feel?” and ‘Nai’s March’ – a track that compares computer games with the reality of natural disasters in Japan – includes the Japanese for Thank You Very Much to display this cross-continental vibe. Their formation and development as a band is as modern as it gets: they initially became a band over the internet, and despite 7 of the 8 now living together in East London, they still share ideas and formed the blueprint of the album over the internet. So it’s no surprise that social media is a subject heavily documented on their first release. YouTube is also powerful for giving people fame at a rapid rate and they will do anything to achieve this, even if it’s selling their integrity for silly stunts or advertising promotions. An idea played with on ‘Everybody Wants To Be Famous’. Yet there’s a danger of social media taking over a person’s life. This is something reflected well on ‘Nobody Cares’ about anxieties caused by an overbearing amount of opinions and on ‘Reflections On A Screen’ of which Orono confesses to being a victim of the obsessive computer culture, as she’s most happy when she is “sat in bed lit by the light of a silly gif playing on repeat“. Another way that Superorganism represents youthful people is through the production of the album. One criticism of the young is that they lack an attention span. Superorganism’s production is Red Bull-fuelled. It’s muliticoloured yet haphazard and spontaneous in its pace (which stop-starts, speeds up and slows down), in its vocals (which overuses the super slow deep voice and squeaky cuteness) and its application of samples, which start off as really charming – a mixed variety of bird sounds to show their preoccupation with nature, to TV show clips, to drink-pouring, to audience cheering – but becomes a bit excessive after a while, sounding like a substitute for a lack of ideas and the novelty buttons on a keyboard. 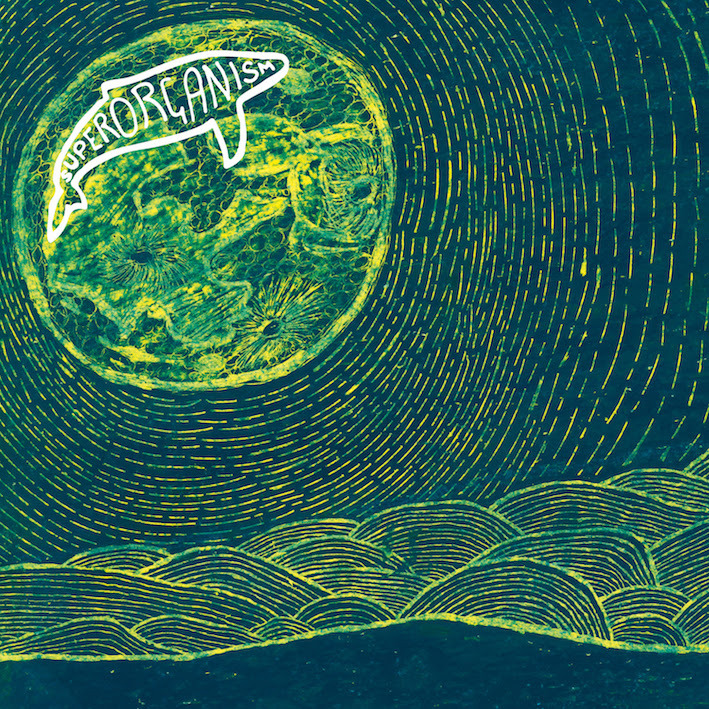 There’s consistency in the steel guitar vibrato/country twang that’s one of Superorganism’s motifs and in the vocal guide of Orono Noguchi. Her nonchalant and deadpan personality – which also come across in interviews – is a good contrast to the wildness that surrounds her, stops the music from being overblown in its technicolour and makes her a relatable character within the chaos.